Cooperating with local operators in hospitals, health centers, villages and universities, MAF helps partner organization CUAMM protect and improve the wellbeing and health of vulnerable communities in Sub-Saharan Africa. 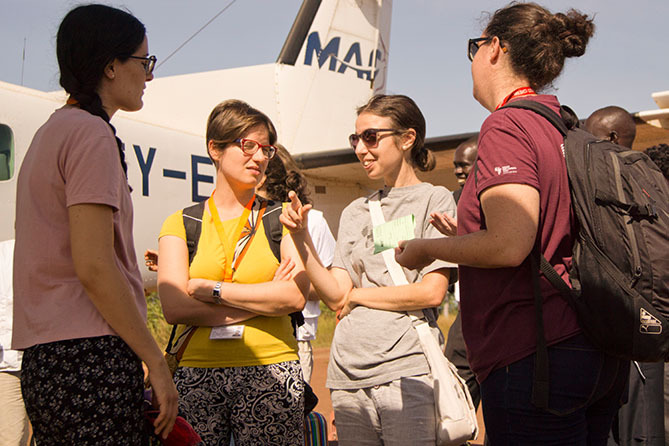 Founded in 1950, Doctors with Africa CUAMM, an Italian non-governmental organization (NGO), started operating in South Sudan in 2006 with the reinstatement of an old hospital in Yirol, in the center of what is now South Sudan. Health and nutrition were the two major sectors of intervention. Today, in collaboration with the Ministry of Health, CUAMM now supports five hospitals in Yirol, Lui, Maridi, Rumbek and Cueibet, thus strengthening the secondary health care system. Primary health care is provided through supporting 160 Primary Health Centres (PHC) with health facilities and operation theatres in the areas where the hospitals are and another four PHCs in Nyal, due north from Yirol in Panyijar County. In South Sudan, CUAMM has 70 international staff and 1,400 national staff working on programmes that are concentrated around health, deliveries and treatment of acute and moderate malnutrition. Approximately 30 % of the international staff come from Italy, and the rest are from Europe or neighbouring countries to South Sudan. Since 2006 CUAMM has renovated Yirol hospital and it has since grown bigger still. In 2014, CUAMM opened a midwifery school in Lui Hospital, and in July 2017, 20 students graduated as midwives. The second intake of midwifery students, selected by the Ministry of Health, will be in 2019. It is difficult to find donors for this second intake, and there is also a limit to the hospital’s capacity; there would simply not be enough room or deliveries if more students had come together with the first class. All students need to attend 50 deliveries and 100 antenatal care visits during their three years at the school to be properly equipped as midwives. The security during the school’s first three years was bad, and the students had to be evacuated twice from Lui in December 2015 and November 2016. Consequently, a place in Juba was rented and the school moved together with the teachers and the principal during the evacuations. CUAMM’s major donors are Health Pool Funds for health, UNICEF and WFP support nutritional matters, the Italian Cooperation (governmental), international foundations and private donors cover the rest. Especially the midwifery school is funded by private donors and foundations. 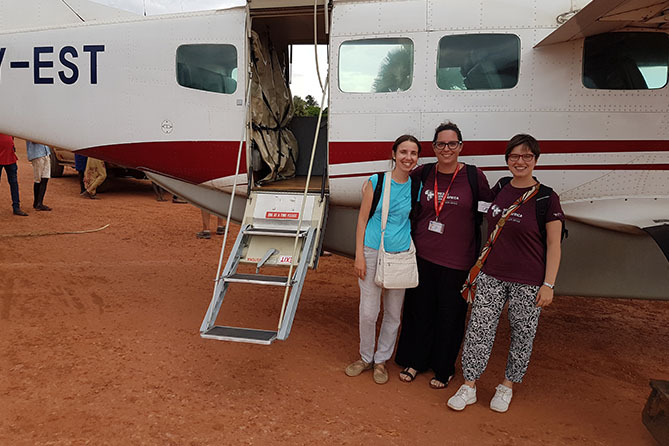 Giorgia Gelfi, country Director of CUAMM South Sudan, arrived in South Sudan just before the 2016 crisis. She was travelling upcountry and couldn’t be evacuated as many other expats were, so she just stayed where she was and hoped for the best. The crisis didn’t discourage Giorgia, although she does find working in South Sudan very challenging. “You can’t become annoyed with the conditions,” Giorgia says. “I have worked in other countries before, all in emergency relief, but South Sudan is special, because the reality of logistics and security is constantly changing. As a country director here, opposed to my colleagues elsewhere, you have to be involved in even the smallest details, and retain huge quantities of information to be able to do your job. R&Rs (Rest & Recreation) every 11 weeks are really needed to get a break from it all,” Giorgia says laughing. As a matter of fact, she never manages to leave when the time comes for an R&R, but she doesn’t mind the extra work, she says, because it is so interesting and the needs are everywhere. Giorgia studied International Relationships, specializing in Human Rights, and got employed in the administration of several NGOs, including CUAMM, for 9 years. After having worked as Country Administrator for some time she was offered the job as the Country Director of South Sudan. CUAMM has a very long history with MAF in other African countries, before CUAMM started operating in South Sudan. When MAF a few years ago said that they were opening up a shuttle that twice a week would fly to Maridi and Mundri, close to Lui, they were very excited. They had been using the roads, but after the crisis in 2016 they became too insecure and they were obliged to charter flights every two weeks to transport staff, goods and medical items. 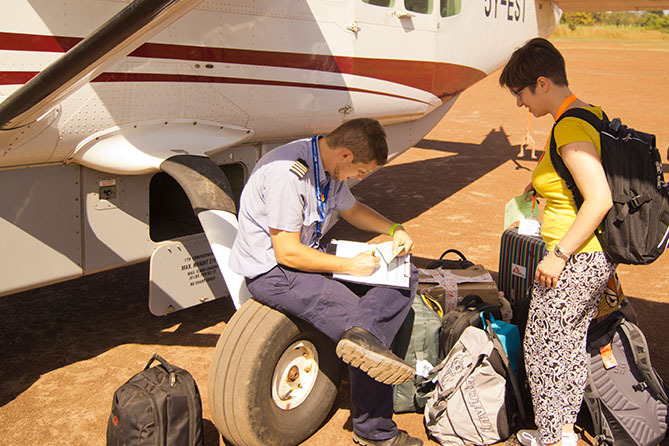 Nowadays, CUAMM uses both UNHAS and MAF to fly them to different locations in South Sudan. Yirol, Maridi, Rumbek and Nyal have airstrips, whereas the hospitals in Lui and Cueibet are only accessible by road after having flown to either Mundri or Rumbek. This poses a threat to the security of the staff whenever they travel to and from the hospitals. 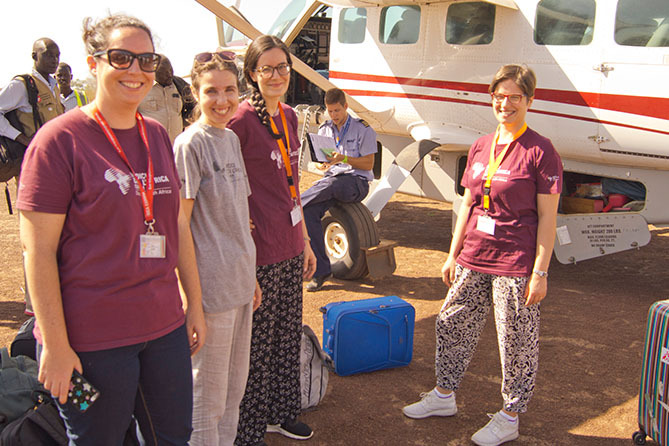 On a two-week monitoring visit using MAF shuttles and charters to CUAMM’s main offices in South Sudan, Giorgia is accompanying three colleagues from headquarters in Italy; Ilenia Fattore, the Desk Officer at HQ in charge of finance and administration in South Sudan, Chiara Scanagatta, the Desk Officer at HQ in charge of programmes, and Camilla Arvati, assistant to the two Desk Officers. Together they will be defining CUAMM’s South Sudan strategy for 2019.